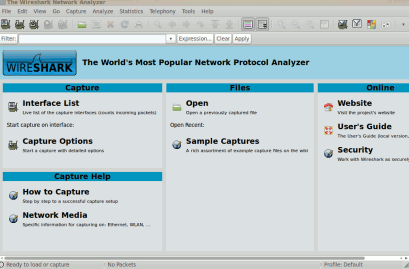 Wireshark is one of the most widely used network packet analyzer to capture the network packets and help you in analyzing those packets by providing as much details as possible.It is an Open Source software and available free for all major platforms.Wireshark is specially used by network administrators to troubleshoot network problems and ethical hackers use it to test security loopholes in the network.Wireshark is also helpful for beginners who want to know more about the internal implementation details about the network protocols and packets. 1. Open Synaptic Package Manager from System->Administration->SPM. 2. Now,search for “wireshark“(excluding double quotation mark). 3. 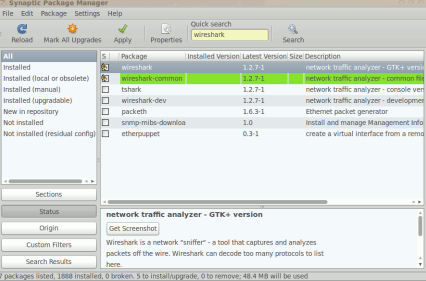 Then,check the box that indicate wireshark – network traffic analyzer GTK+ version and mark the additional required package too. 4. Next,click on Apply to begin the download and installation procedures.It will finish within few minutes. 5. you have installed Wireshark successfully on your ubuntu computer.To access it go to Applications->Internet->Wireshark.